Genre: Arfica and animals and it is real! Monica on Goodreads.com reviews this book. I like how she does it.. especially her reticence to read it as is this just another book that uses and glitzes and manipulates the stories of Africa? "I absolutely did not want to read this book. 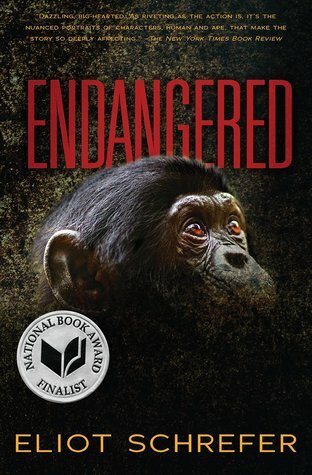 The advance reader copy sat on my shelf for months untouched as I assumed it was yet another book offering a simplistic view of Africa, one that focused on the plight of an exotic animal while barely acknowledging the complications of the people who lived around it. Having lived in Sierra Leone for two years in the 70s, I'm techy about how the continent is represented, especially by well-intentioned outsiders who focus on its animals at the expense of its people. That said, I know that it is very, very hard to even begin to present to anyone, much less to a young person, the horrible complicated conflicts such as what happened in Sierra Leone a decade ago and what is still happening in the Democratic Republic of the Congo. Still it was only when I saw that the book was a finalist for the National Book Award that I finally picked it up. And then did not put it down again until I was done. By the end, I was completely won over. 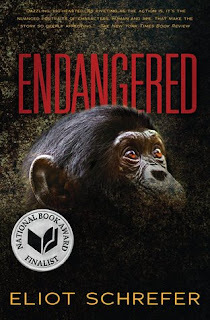 Schrefer has crafted an outstanding work about Africa, about bonobos, and about the complexities of the relationship we humans have with the world around us."